• Gorgeous design, inside and out. • Amazingly comfortable. • Very refined powertrain. • CVT auto is a bit artificial. • Kiriko glass a costly option. The year was 1989. Japanese automotive giant Toyota had been eyeing a way up the automotive food chain for a while, and noticed North America’s appetite for enormous, powerful, and luxurious saloons. The Mercedes-Benz S-Class had been doing quite well there for some time, and BMW was lining up a new 7-Series to bring to the fore. Then they unveiled a new brand called ‘Lexus,’ and with it, the LS400. It had a V8 motor up front, typically-Germanic styling, and undercut the competition by a long way in price. Needless to say it caught the attention of the Americans, where Lexus still enjoys immense success today (about half of global Lexus sales comes from North America). In fact, Lexus gets to stand on the podium in terms of luxury automotive sales, robbing Audi of the position of second runner-up, with only BMW and Mercedes-Benz ahead. However, that was nearly 30 years ago. The Lexus LS has gone through various iterations, some more divisive than others, and now it’s arrived on our shores in its fifth generation. With incredible style and panache, the Lexus LS is easily one of the most distinctive cars in existence, forget just in the limousine category. With either a turbocharged V6 or a petrol-electric hybrid powertrain under the skin (and for the first time, at the same price), the Lexus LS is aiming to once again challenge the German establishment of the Audi A8, BMW 7-Series, and Mercedes-Benz S-Class, while also fending off attacks from fellow left-fielder Jaguar XJ and the more pointy rivals like the Porsche Panamera. Oh, and if anyone’s wondering, it’s still about $500 cheaper than an base S-Class. While most limousines try and hide their sumptuous interiors beneath elegant, restrained, and mature exteriors, the LS… just hasn’t done that at all. The spindle grille up front is now wider than it has ever been, and features 5000 surfaces (or 7000 on Sport Luxury trim) that were each placed by a Lexus designer that took over 14 weeks to design. One review said that it’s a crying shame that they have to leave space for the numberplate in the middle of that web-like structure, and we agree. That intricate grille is flanked by triple-barrel LED headlights, that are further enhanced by the use of beautifully-distinctive LED daytime running lights, with three ‘strands’ visually connecting the headlight modules to the larger daytime running light beneath. Beneath those lie two large air intakes that channel air towards the new engines, as if the grille wasn’t doing a good enough job of that. Down the flanks you’ll see complex surface play, highlighted best by the silver shade that does a damned good job at imitating liquid metal. You’ll notice the large alloy wheels too, full chrome on the Sports Luxury models, that will undoubtedly appeal to the American market. While we’d usually deride cars for using full-chrome alloys for being a bit chintz, the Lexus LS seems to work well with them. Perhaps its the already-distinctive styling that makes it work. To the rear, it’s all standard form though. The taillights, while intricate (and feature their own tri-strand design that mimic the light signature up front), don’t have the same wow-factor as Lexus proved they’re capable of in the LC coupe. The same can generally be said of the whole rear-end really, as nothing appears to push the boundaries that much. It’s like the rump was conceived simply as a way to tie in all of those complex, intricate, and mesmerising details that began up front and extended down the side. But as a neat finish to a masterpiece, it does that job pretty well. We think it’s pretty self-explanatory that F-Sport models (the standard trim level here) feature a more aggressive design language with unique bumpers, unique alloys, and so on. The Sports Luxury is the one we’d recommend though, because it just looks and feels like the more natural fit for the LS. While you could accuse Lexus’ new design language of being a bit complicated (we admit it’s divisive, but they don’t mind that), they have at least simplified the engine lineup. The LS has had a history of offering simple drivetrain options, reducing the headache for those who might be eyeing one. For the first time ever, the LS is no longer available with a V8 motor. Instead, you’ll find two petrol engines with six-cylinders arranged in a V, with one featuring turbochargers and the other a hybrid electric powertrain. The base LS500 comes with a 3.5-litre twin-turbo V6 motor, producing an impressive 310kW and 600Nm. This engine is powerful, light, and smooth, and sends power to the rear wheels via a 10-speed automatic transmission. This will definitely be the mill for performance-oriented buyers, though to that end, the automatic transmission can feel a bit clumsy when you drive fast. Lexus LS limousines for the Australian market send power exclusively to the rear wheels, while global markets have the option of an all-wheel drive powertrain. For a long time, Lexus has played the Germans’ game of luxury limousines and have largely been left behind, with buyers preferring the more established players on the scene. Rather than trying to out-German the Germans, it seems that it’s dawned on Lexus that perhaps the way to beat the competition is to simply reinvent the game. Why bother trying to be German when they can be entirely Japanese? This new way of thinking is perhaps most evident in the cabin. It’s full of touches that look back on Japanese craftsmanship, from the sweeping air conditioner vent slats, the beautiful hemmed-in element that stretches from the drivers’ door all the way round the dash and to the passengers’ side, even the way the seat bolsters ‘flatten’ themselves to ensure easier ingress and egress before hugging you as you want them to once you’re inside… all of this screams of a unique attention to detail, driven by what the Japanese call ‘Omotenashi’ values of hospitality. Where some cars can be accused of not feeling ‘fancy’ enough when sat inside, you can’t level that accusation against the Lexus LS. It’s a fabulous car to sit in, to touch, to feel, to experience. We say that because the engineers and Lexus have gone to great lengths to ensure that all you ever experience inside is penultimate luxury. The dash is dominated by the large central infotainment screen, which looks gorgeous and displays what it needs to in a crisp, clear manner. Only issue is that they’ve retained the fiddly touch-pad input system that isn’t the most intuitive to use. Move away from that and you’ll enjoy swathes of ultra-soft leather, accurate and consistent stitching, and supportive seats with more than enough space for four passengers. A fifth could be shoehorned in the middle of the rear bench, and while they’ll be more comfortable there than in a supermini, they may start to whine after a while. One of the most major improvements under the skin of the new LS is the GA-L platform, which is now stiffer and less yielding than the previous-generation chassis. As a result, the LS is now pointier to drive than before, offering a degree of agility and control that you wouldn’t normally expect from a big Lexus. However, those expectations need to be tampered. It’s by far the best Lexus LS to drive, sure. But it’s nowhere near as sharp to drive as say, a Jaguar XJ or a BMW 7-Series. The LS’ driving experience is one of confidence and competence, allowing you to hustle on at ridiculous speeds without ever thinking that maybe the LS isn’t cut out for it. If you want a sports car, look elsewhere. No luxury limousine these days would be complete without a rudimentary sprinkling of the very latest technology available, particularly in regard to active driver assistance systems. The Lexus LS doesn’t deviate from that rule, being the smartest Lexus to date. Safety System+ is a standard range of advanced driver assistance systems that brings a raft of features to the fore. You’ll find things like adaptive cruise control (with traffic jam functionality), AEB with pedestrian detection, lane-keeping aid, blind-spot monitoring, rear cross-traffic alert, and a bonnet that pops up to cushion the blow should a pedestrian cross your path anyway. It’s worth noting that Safety System+, while impressive, is some way off the mark insofar as properly advanced driver assistance systems are concerned. The Audi A8 offers Level 3 autonomy, while the leading German marques have more comprehensive systems in their corner. But that said, Lexus does offer up an impressive after sales experience to balance out the offer. Lexus continues to lead the way in after sales service and customer satisfaction, while the LS specifically enjoys 10-year complimentary roadside assistance, with zero conditions by the company. All models get digital instrumentation, an enormous infotainment screen, and a less-than-intuitive touchpad input method that leaves a lot to be desired. Thankfully, everything but that touchpad is well-executed, with the digital dials especially, as it’s both easy-to-read at a glance and pleasant to look at. You’ll also find four electric seats as standard, as well as the usual climate control, soft semi-aniline leather, and so on. A luxury car, this most certainly is. Lexus might still be a fringe player for the most part, but the LS certainly deserves to be taken seriously. A modern powertrain, a gorgeous cabin, and a bold and adventurous exterior means that the LS won’t appeal to everyone, but it certainly doesn’t have to. The LS isn’t just for any executive, it seems. With the presentation of the latest-generation model, it’s clear that Lexus wants its latest limousine to tug at the heartstrings of the well-heeled executive that wants his limousine to stand out from the crowd. That huge grille, those slender eyes, and that imposing stance… the Lexus LS is most certainly capable of making a statement, for all the right reasons. Sure, a Mercedes-Benz S-Class is more comfortable, and a Porsche Panamera is better to drive. But the Lexus LS isn’t aiming to steal sales from those cars, par se. What Lexus envisions (we think) is that the LS buyer is the extravagant, extroverted connoisseur who has had to make do with the LS’ rivals in the past. Rather than stealing sales, Lexus probably feels that the LS merely reclaims them, bringing customers who’ve been looking for something just like the LS back into the warm embrace of the Lexus brand. Admittedly, it’s not all wonderful. The CVT automatic still feels way too artificial, and there will be some (but only a few) that will grumble about a lack of a diesel powertrain. But really, the Lexus LS is an incredibly accomplished luxury limousine, the way it always has been. It’s just now much, much better to look at. If you do lots of motorway miles, we’d suggest going for the twin-turbo 3.5-litre V6. 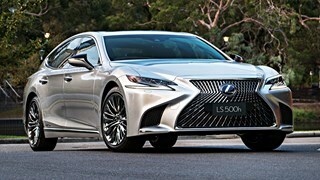 However, if you just saunter around the business district with a chauffeur up front doing all the work, the LS500h might be more your bag, offering better economy at urban speeds. However, if you do relatively long-distance commuting or take in long motorway drives regularly, we’d suggest looking at perhaps a diesel Mercedes-Benz S-Class, or even take a gander at the Jaguar XJ if you feel a limousine ought to also be rewarding to drive on B-roads.